Clover Trail chip would be a good match for Windows 8 tablets and convertibles and should be in time for the new Microsoft operating system is expected to be released to consumers sometime in the second half of 2012. The only thing here is that while Intel dicusses deal core, many of its competitors like Nvidia, Qualcomm, and Texas Instruments are already discussing quad-core chips based on the ARM design. 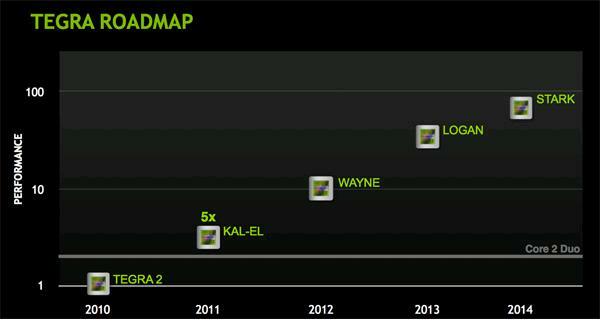 Nvidia for sure is bringing forth Quad core chips for tablets and high-end “super phones” by end of this year. Qualcomm and Texas Instruments are shipping dual-core ARM-based designs into products now with plans for quad-core later in 2012. And Apple’s next-generation A6 is rumored to be quad-core too. All this actually puts Intel at least one generation behind its competitors. “The beginning of the end for Intel”,”The year that a small UK chip designer began to eclipse the largest chipmaker in the world”! Undoubtedly, all these estimates about Intel are grossly wrong in the present context. But whats not wrong, is that Intel is increasingly falling out of favour with the next gen computing: Smartphones and Tablets. It can’t be denied that ARM-based chips will pose a growing challenge for Intel and as Bob Morris director of mobile computing at ARM put it: “All the logos are all the same size which I thought was pretty cool,”. All the Logos were the ARM logos and he was talking about the tablet show at CES. ARM monopolizes the tablet category. And now its has Microsoft rooting for it. ARM shares saw a healthy 7% jump with the Microsoft announcement. Intel is always better when it’s challenged, so we’ll get better products as a result. 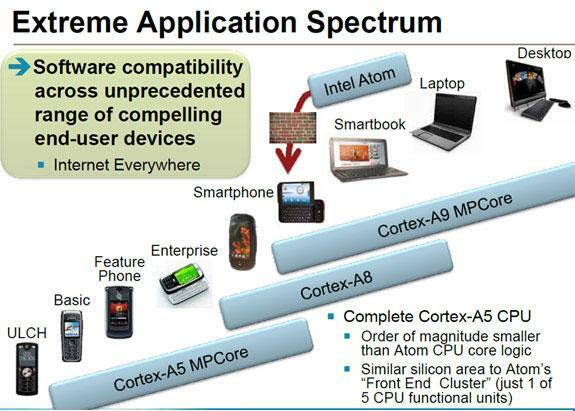 Intel may soon have its own Atom microprocessor for smartphones. This is sufficiently delayed after Intel had announced Atom for smartphones last May. We’ll probably see a Nokia Intel-based handset running MeeGo at Mobile World Congress next month. It is is not architecture any more, it’s a business model. Whats working for ARM is the support it already has:Qualcomm, Samsung, Texas Instruments, Nvidia, Apple and now Microsoft.ARM’s benefit is that, while it designs the architecture, it uses a licensable model. That means that manufacturers, such as Nvidia with the Tegra or Qualcomm with the Snapdragon, can make their own design adjustments before manufacture. Snapdragon, for example, features Qualcomm proprietary GPU technology. They can also pick the best ARM processor to go in their products and that freedom of design and manufacture is something Intel won’t offer. Apple is a unique case as it now has its own chip design firm – it bought PA Semi who designed the ARM-based Apple A4 chip. Barring a simply earth-shattering seismic shift, Apple won’t be using Atom inside the iPhone 10 or iPad 5. So then, even if Intel matches ARM feature to feature soon, it will have a task competing against all these different companies, because they’re going to be one of many… its an eco-system these are early days for the Tablet eco-system and Intel has a task in order to get on top of things. Not many are betting in favour of Intel, but its too early to count them out. 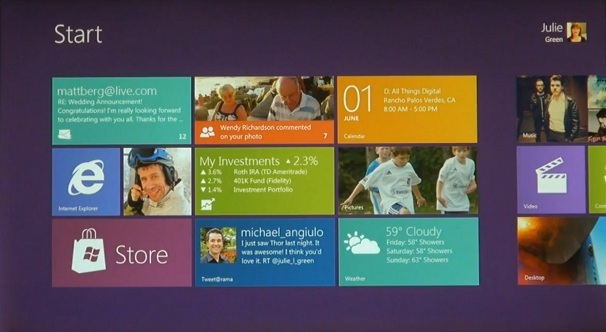 The next version of Windows, currently codenamed Windows 8 may indeed have a special version tailored for tablets. But it won’t be out until 2012 at the earliest. That’s more than two years after the iPad’s debut, and long enough for other tablets to establish a huge head start–just like Apple with the iPhone and Google with Android phones. 40% of users plan to use their tablets for business. That has dire implications for Microsoft’s core enterprise business–each tablet potentially replaces corporate purchases of laptops running Windows, and requires IT departments to support non-Windows clients to connect to corporate applications. Once that happens–as it has with the iPhone–IT departments might begin to question why they’re running so much Microsoft back-end software like Exchange for email, giving competitors like Google a wedge into Microsoft’s most important business. While Windows’s move to ARM for a tablet venture is assumed to take care of the Microsoft deficiencies, the partnership doesnot answer a few definitive questions for Microsoft on the tablet platform. •	The main advantage of ARM is better battery life. But the main problem with Windows on tablets isn’t battery life, it’s lack of a usable touch interface and compatible touch applications. A rehashed Windows CE is not expected to solve that problem for Microsoft! •	Porting the full desktop version of Windows to ARM would be both incredibly expensive and useless: it wouldn’t solve the touch interface problems, and it wouldn’t have the main advantage of Windows on Intel, which is compatibility with hundreds of thousands of existing apps and hardware peripherals. •	Creating a special embedded version of desktop Windows and letting hardware makers pick and choose the pieces they want to use (as Microsoft did with Windows CE) would be even worse: every “Windows” tablet would potentially have a different user interface, different features, and work with a different set of programs. •	Building a new tablet OS for ARM processors based on desktop Windows might solve the touch interface problems, but still wouldn’t run traditional Windows desktop apps. So why bother? It would make much more sense to build the tablet OS based on Windows CE, which has run on ARM processors forever. In addition, Microsoft has already built a great touch interface and development platform on top of Windows CE–Windows Phone 7. Microsoft isn’t announcing a version of desktop Windows that supports ARM. Instead, it’ll announce a new platform based on Windows CE–now called Windows Embedded Compact–with some new user interface elements for tablets. But this initiative will fail unless Microsoft does the same thing it did with Windows Phone 7 and places restrictions on hardware makers so that all Windows tablets look and work approximately the same way. If Microsoft lets hardware makers run wild with the tablet OS, like they can (and do) with Windows Embedded Compact on tablets today, then the entire project becomes meaningless. Is the end of the long heralded Wintel Platform nigh? Or so it seems. 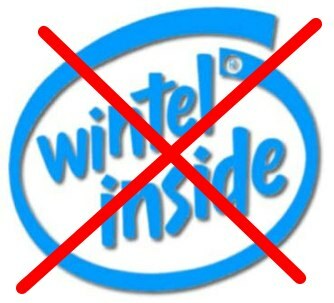 Click here for an earlier post on Wintel failing to ride the future. Microsoft’s big announcement that came this CES was that it was making the next version of Windows work on ARM chips. It’s a major break in Microsoft’s longstanding relationship with Intel. On the other hand, Intel has nothing significant about its Smartphone or Tablet plans at CES. However, Intel has reportedly reorganized itself with a new tablet and netbook group and is splitting its tablet strategy between Windows, Google’s Android, and Nokia’s MeeGo operating systems. Microsoft parting ways with Intel has touched a nerve with Intel. Citing a lack of foresight on the part of Microsoft, Intel has commented that PC makers like Dell and Intel had been trying to get Microsoft to tailor Windows for touch-screen tablets for years, with no luck. This was because revamping Windows for different types of devices is expensive and time-consuming, and Windows revenue had been growing just fine without Microsoft venturing into newer categories. Tablets only became a problem for Microsoft when non-Windows tablets started cutting into Windows PC sales. That’s starting to happen now, which is why Microsoft is finally taking notice. Is it too late? Microsoft has a couple of good concepts in Kinect and Surface and that could be leveraged going forward, but from the looks of it now, Microsoft’s inability in predicting the future in computing may cause it to loose ground in Tablets. Will History overwhelm the Wintel Platform? For as long as I remember, Computers meant Windows and “Intel Inside” to me. This was called the “Wintel” platform because the Microsoft Windows operating system and Intel processors were virtually synonymous. In an era of rapidly increasing mobility, though, Intel and Microsoft are facing an uphill task. Their de facto dominance has been challenged and are now faced with potential irrelevance. Both Microsoft and Intel are fending off competitors in their core markets, while also struggling to establish a presence on smaller, mobile platforms. To many, this is the history of computing revisited. 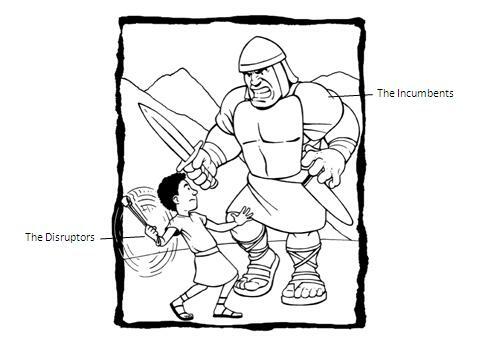 Each wave of computing had its share of Goliaths (Large and Powerful incumbents) loosing out to Davids. There was mainframe first, which was dominated by IBM, then came the mini computer dominated by DEC in the second wave, then came the third wave with workstations dominated by Sun and Apollo, then the PC which is where Wintel had a free and undisputed run. Now it’s the mobile architecture that is going to be the main computing platform at least on the terminal side with the cloud backing it as the Data dump. Android is also subtly shifting our understanding of the purpose of an operating system. Android is a means to an end for Google. The better Android is and the more it lets us do, the more of our data Google can potentially get access to. And data is Google’s raison d’être. By way of comparison, Windows is an end in itself–a dead end. Microsoft gains little benefit from Windows other than the income from software licenses, which is starting to sound like a very old-fashioned way of thinking in this age of mobile devices and data clouds. Windows Mobile 7.0 and its suit of services have been launched and have received some traction. However, challenging the Android would be mean WinMo 7.0 would have to play at a different level altogether. What smartphones and tablets have in common is that they are almost universally built using ARM processor technology rather than Intel. ARM also powers the next big category of products: Tablets, EBooks and Internet TVs (Google). It is not that Intel is unaware of the benefits of the ARM architecture on mobility platforms. The tablet processor architecture unveiled by Intel codenamed Oak Trail–is a system on a chip (SoC) that promises to consume 50 percent less power while also enabling full HD video playback. 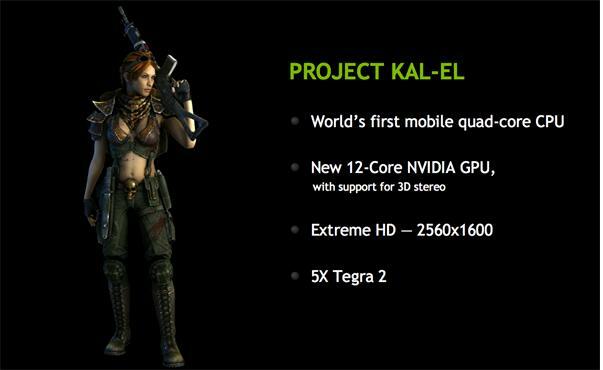 This however is not expected to go into production until early 2011. In the mean time, ARM steam rolls establishing very key strategic partnerships that would take it to the next level. Both Microsoft and Intel have been late to react to subtle shifts in the landscape which have suddenly cascaded into a all embracing powerful wave. Both these powerhouses are making and effort to re-orient and re-invent their businesses. However, the falls of greats in computing history is a telling story. One thing is for sure, though–the fight for market share and market relevance will be good for business professionals and consumers because it creates competition which will force all parties to be innovative in their designs, and appealing in their pricing in order to set their smartphone or tablet apart from the crowd. In an earlier post, i had written about how the fight for Tablets and Embedded Devices (Google TV, eBooks) would redefine the microprocessor space and would possibly be the showdown between ARM and Intel. This post examines how the business model of ARM scores over that of Intel in creating new segments and future in mobility processing. 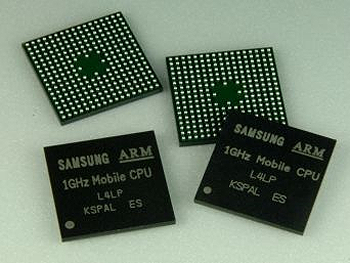 ARM-designed processors are still expected to remain the dominant technology in microprocessors for three contributing factors: ARM’s well-established network of silicon partners allowing downstream players to diversify their solution providers, energy-saving features which provide higher microprocessor computing speed and ability, and software support around the chip architecture enabling mobility devices like tablets and other embedded devices like Google TV and E-Book readers. The idea is pretty simple: ARM processors may be lower-performing cores, but they use less power; and in an era where one of the big defining characteristics is limiting power to the server room, multiple ARM cores might deliver more processing for a set amount of power. 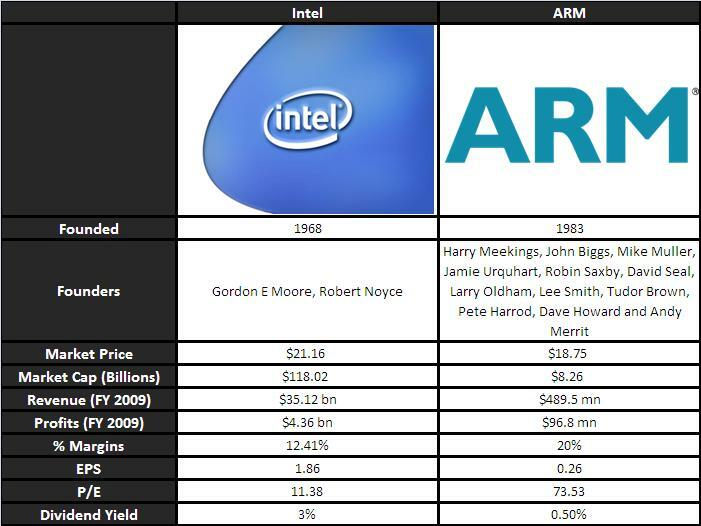 The distinction between Intel and ARM is the business model. Intel, designs and manufacturers its processors end to end , where as ARM, designs the processors for other companies such as Texas Instruments, Marvell, and Samsung to license, refine, and build themselves. This in effect redefines the battle. Quoting Herman Hauser, co-founder at ARM, ‘it’s not Intel versus ARM, it is Intel versus every single semiconductor company in the world.’ That threat to Intel is not ARM per se, but from vertically integrated manufacturers like Apple — who do everything from product design right down to processor design. If a company like HP decided to follow suit, e.g. by buying Palm for its OS and licensing ARM, that might be a nightmare scenario for Intel. It’s hard to argue with ARM’s corporate performance: this year the company has collected more revenue from its licensed designs than Intel has on its microprocessor sales, while still allowing its customers to make a profit of their own from the chips they manufacture. Increasing interest in the low-power chips from netbook, ultra-portable, and even server manufacturers shows that ARM’s long absence from the desktop and server markets could be drawing to a close. As convergence fuses desktop and mobile computing together, Intel with its desktop monopoly and ARM with its Mobile computing expertise are engaged in a battle to claim the crown in the converged product: Tablets and Embedded devices. Intel has started mass production of its Oak Trail platform which combines the Atom Z670 microprocessor and SM35 chipset. This is being readied for the Meego OS (in conjunction with Nokia) and could be customized to Windows as well. On a larger scale the Oak Trail would be targeting the Tablets. The battle for dominance in microprocessors has sharper lines drawn. 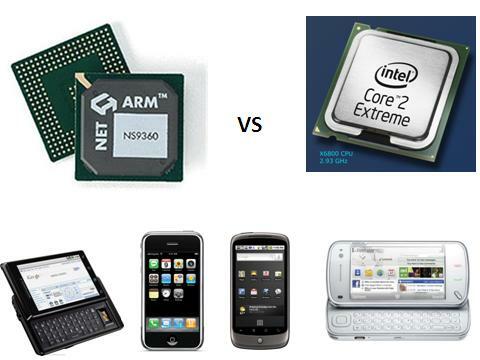 Intel dominates the server and the desktop spaces, whereas ARM dominates the Mobile phone computing. While Intel tries to make incursions into AMD territory of Mobile computing and vice-versa, the next big platform to be designing microprocessors for will undoubtedly be Tablets. The idea of ARM-based servers is pretty simple: they may be lower-performing cores, but they use less power; and in an era where one of the big defining characteristics is limiting power to the server room, multiple ARM cores might deliver more processing for a set amount of power. Where ARM also gains in the servers market is a bit of help from start-ups who are innovating on the ARM platform. An example is Smooth-Stone/Calxeda which has innovated and produced an ARM SOC (System-on-a-chip), will deliver a 10-fold improvement in server efficiency, on the system level. While this delivers an edge to ARM in terms of big data application servers, the mass markets will still be the typical corporate servers and ARM will take a lot of doing to unsettle Intel – AMD here.It took Intel and AMD at least 10 years to build the x86 platform to dominate the server space, and it would probably take just as long for someone to unseat them. It will also take years to build up the ecosystem that exists around x86-servers from both Intel and AMD. Even as Intel-AMD enjoy a near monopoly in desktop and servers, Intel’s next ambition was to take on Mobile platforms, which is ARMs stranglehold. 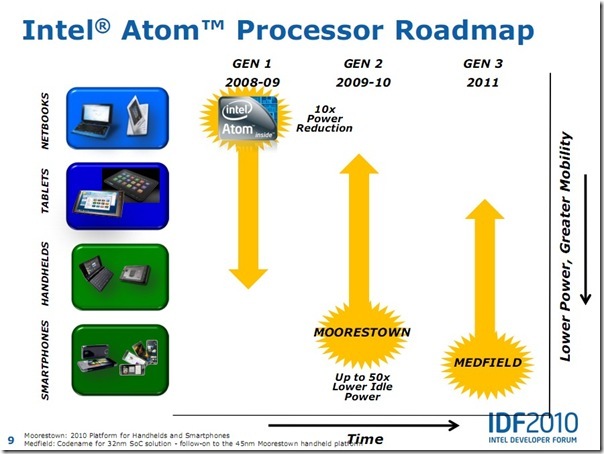 2011 would see Intel announcing the Medfield version of its Atom microprocessor. The Medfield is a 32nm SoC design which means reduced power consumption, and that in turn would make it more appropriate for small mobile devices.Even if the chip has the performance and power to compete, it will take a long time to build up an ecosystem. Almost all the operating systems and applications aimed at phones today are written for ARM-based platforms which seems to be one reason Intel has talked about its software, particularly its MeeGo operating system, so much. Thus the real competition for the crown of Microprocessors takes place in embedded devices and in tablet PCs which is what both Intel and ARM are targeting so aggressively. Continued here. Is Intel falling behind ARM in the war of Smart Computing? Microprocessors and Intel is synonymous. I am the generation that has grown on the 236, Pentium I,II,III,IV generation of microprocessors and had been re-assured of the computing experience with the “Intel Inside” logo. However, Intel’s story has been very different in mobile computing. It started late, was not fleet footed and hence let ARM run over with a near monopoly @ 90% market share and tie ups with giants such as Marvell, Nvidia, Qualcomm, Samsung, ST Ericsson, Texas Instruments and even Apple. Intel’s reaction to ARM came late through the Atom series and platforms Menlow (its first attempt at a processor platform) and Moorestown (the latest one). Moorestown for all that its worth doesnot include design wins in high volume device categories and is thus unlikely to reach high volume products globally. Thus the appeal for Moorestown is rather limited and can at best be Intel’s “opening the door” or “beach-head” in the mobile devices computing space. It will possibly get the smartphone game started for Intel and cement relationships with tier one device manufacturers. The Moorestown platform will also be important from the perspective of joint development exercises such as Meego and Android based products.The next evolutionary step of Intel, called the Medfield will possibly be the best solution for the advanced mobility devices which thus will take Intel’s fight to ARM. On the other hand, ARM is gaining from strength to strength. First a 90% Monopoly on Mobile and Handheld computing devices and then the partnerships with chip makers such as Nvidia, Qualcomm, Marvell, Samsung, Texas Instruments and Apple. That is some arsenal out there. Not to leave it alone at the markets and their partnerships, ARM is rapidly evolving its platforms to multiple core supports which thus enable very high computing power. This is something that Intel is missing in its arsenal sorely and there is no Intel product in its roadmap which takes the multi-core to higher levels. Thus ARM with its products and technology may exceed Atom based processors in raw computing terms by 2011.Intel thus needs a multi-core architecture plan for Atom processors within this year or risk being out-computed. 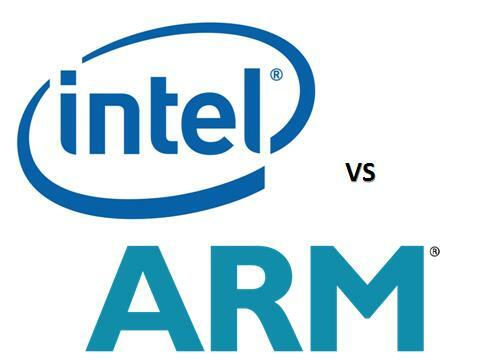 What it also means is that ARM will take the threat to Intel’s strong hold i.e Computing devices very effectively. So while Intel tries to enter ARMs market with Moorestown, ARM is planning to invade into Atoms home turf with multicore processors. The future @ Intel appears to be hinged on its own software on its processors and its partnerships with larger manufacturers. Intel’s acquisition of Wind River (for software, middleware and embedded systems), Meego and Nokia Qt platforms are critical to Intel’s success even with a less advantageous Moorestown for the time being. Last word: Intel seems to be going the Nokia- Microsoft way who failed to read the winds and were swayed away by the changed that ensued. Intel being Intel however, it will be interesting to watch how it goes from here.